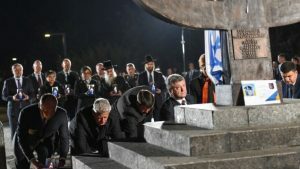 KIEV — Ukraine on Thursday marked the 75th anniversary of the single largest single mass shooting by Nazi forces during the Holocaust in a somber ceremony attended by Ukrainian President Petro Poroshenko and other world leaders. The massacre of nearly 34,000 Jews on September 29-30, 1941 in Kiev’s Babi Yar ravine was unprecedented in its scope — even for Nazi Germany’s notoriously brutal genocide of European Jewry — and has been a source of controversy over the participation of local Ukrainian collaborators in the mass killing. At the ceremony, Poroshenko addressed the sensitive issue, saying “there have been those [in Ukraine] for which one felt shame. And this, too, cannot be erased from our collective memory. “No Ukrainian has the right to forget this tragedy,” he said. Israel’s President Reuven Rivlin was in Ukraine earlier in the week to attend a number of memorial events, but cut short his visit to attend the funeral of his predecessor Shimon Peres. Poroshenko himself will travel to Israel to attend Friday’s funeral of Peres. Rivlin, before leaving Ukraine, drew criticism for making “undiplomatic” comments about Ukrainians’ role in the massacre. Rivlin on Tuesday told lawmakers in Kiev that “many of the crimes were committed by Ukrainians” during the Holocaust. “They victimized the Jews, killed them, and in many cases reported them to the Nazis,” he said at the Ukrainian parliament. In September 1941, as Hitler’s forces advanced toward Moscow on the eastern front, 33,771 Jews were gunned down over the course of just two days. Along with locally recruited Ukrainian policemen, SS troops brought Jewish men, women and children to the Babi Yar ravine where they forced to strip naked and lined up at the edge of the ravine and shot in the back. Just 29 people managed to escape the execution by either falling into the mass grave before being shot or by wearing crosses to hide their identities. “We heard the shooting behind us, but (my) granny — she kept holding me — did not look back and kept running until she fell exhausted among the graves in a nearby cemetery,” said Raisa Maistrenko, the last survivor of the tragedy still alive in Kiev. Rivlin’s statement caused an uproar among nationalist politicians and other key figures in Ukraine. “What Rivlin did can unambiguously be interpreted as spitting in the face of Ukrainians” at a time when the people he accused of perpetrating crimes are no longer alive to defend themselves, said Bogdan Chervak, the first deputy chairman on the State Committee for Television and Radio of Ukraine. Rivlin also noted the actions of Ukrainian non-Jews who risked their lives to save Jews during the Holocaust. Israel’s Holocaust commemoration authority, Yad Vashem, has awarded 2,544 Ukrainians with the title of Righteous among the Nations for such actions. Ukraine has the fourth largest number of righteous gentiles, as they are called, after Poland, the Netherlands and France. Poroshenko on Friday called on the international community to financially support the creation of the Holocaust memorial museum in Babi Yar. “I urge the Ukrainian and world community to join this initiative,” he said during the presentation of the film about the massacre.